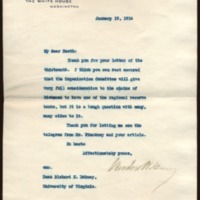 Woodrow Wilson writes to Richard Heath Dabney regarding Richmond Federal Reserve branch. Thank you for your letter of the thirteenth. I think you can rest assured that the Organization Committee will give very full consideration to the claim of Richmond to have one of the regional reserve banks, but it is a tough question with many, many sides to it. Thank you for letting me see the telegram from Mr. Pinckney and your article. Wilson, Woodrow, 1856-1924, “Woodrow Wilson to Richard Heath Dabney,” 1914 January 19, WWP20498, University of Virginia Woodrow Wilson Letters, Woodrow Wilson Presidential Library & Museum, Staunton, Virginia.